Polish rabbi; born at Wilna 1614; died at Cracow Dec. 1, 1676 (Michael; but Azulai and Horovitz give 1679; see bibliography). Among his teachers were Jacob Hoeschel and his son Joshua Hoeschel. During the Chmielnicki revolution (1648-49) the Cossacks plundered Kaidanover's possessions, his valuable library and his manuscripts among them, and killed his two little daughters, and he arrived in Moravia an impoverished fugitive. He was elected rabbi successively of Langenlois in Lower Austria, Nikolsburg, Glogau, Fürth, and Frankfort-on-the-Main, and then returned to Poland, where he died as rabbi of Cracow. 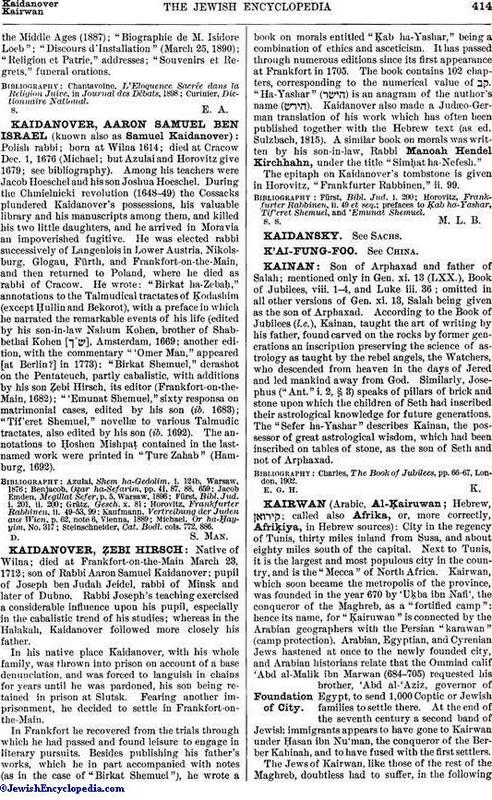 He wrote: "Birkat ha-Zebaḥ," annotations to the Talmudical tractates of Ḳodashim (except Ḥullin and Bekorot), with a preface in which he narrated the remarkable events of his life (edited by his son-in-law Nahum Kohen, brother of Shabbethai Kohen [ ], Amsterdam, 1669; another edition, with the commentary "'Omer Man," appeared [at Berlin?] in 1773); "Birkat Shemuel," derashot on the Pentateuch, partly cabalistic, with additions by his son Ẓebi Hirsch, its editor (Frankfort-on-the-Main, 1682); "'Emunat Shemuel," sixty responsa on matrimonial cases, edited by his son (ib. 1683); "Tif'eret Shemuel," novellæ to various Talmudic tractates, also edited by his son (ib. 1692). The annotations to Ḥoshen Mishpaṭ contained in the last-named work were printed in "Ṭure Zahab" (Hamburg, 1692). Steinschneider, Cat. Bodl. cols. 772, 886.